After a few months of "are they coming or aren't they" speculation, we can tell you - thanks to our friends at the Disney Food Blog - that the Rapid Fill mugs are in use at Disney's All-Star Music Intermission Food Court and All-Star Movies World Premiere Food Court, and will soon be rolled out to the rest of the Disney World resorts. The Rapid Fill system allows Disney Resort guests to buy a resort mug that can be refilled for a certain period of time that is designated when the mug is purchased. The RFID bar code embedded in the mug will deactivate the mug at the end of that designated time period. 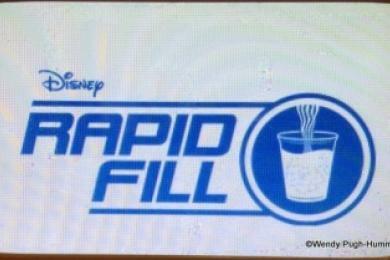 The Rapid Fill mugs are also available as part of the Disney Dining Plan, just like the "old" mugs. The mugs feature this language: "Refills available at no additional charge at Resort Beverage Island located in the resort that this mug was purchased through the end of your resort stay." It's also worth noting that the mugs cannot be refilled immediately after you fill it. Example: If you drink your beverage quickly and want a refill a minute later, you'll have to wait. According to the Disney Food Blog the cups are programmed so they can't be refilled until about two minutes after the screen says "Fill Capacity" reached. Thanks so much our friends at Disney Food Blog for sharing their information and images. 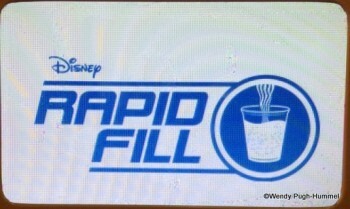 For even more information on the Rapid Fill mug program visit the Disney Food Blog and check out their post on the new mugs. I was hoping you could use them at any resort throughout the park. We're hearing that they will work at any of the resort hotels, but they are still not an option for use in the parks. What happens if you start your vacation with 1 type of mug but then they bring in the new mugs half way through? We were at Port Orleans French Quarter for dinner on Sunday and they had the new mugs too. Great question Robyn! I have no idea. We just bought the new mugs today at the Boardwalk. Haven't tried them yet tho. Will be switched for the new ones. They are supposed to work at any resort self service location. Oh and please folks DO NOT microwave the mugs or put them in dishwashers as this destroys the RFID chip in the mugs.